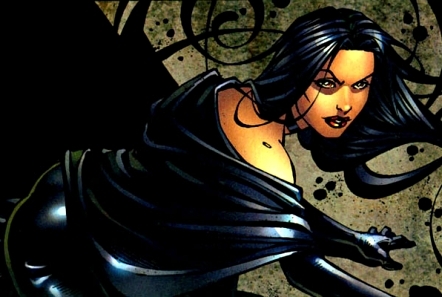 Selene Gallio (Black Queen) is a fictional Character, a comic book supervillainess from the Marvel Comics universe. She is a mutant, and an enemy of the X-Men often associated with the Hellfire Club's Inner Circle - More about Selena Gallio (Black Queen) Character Review...keep reading !! Selene is both a mutant and a powerful sorceress. She possesses a wide range of superhuman abilities, but it has never been clearly defined which of these are her actual mutant abilities and which are skills derived from magic or other sources. Selene is a "psychic vampire" with the ability to sustain herself by psionically draining the life force of other human beings into herself. If she drains a person's entire life force, the victim dies and crumbles to dust in seconds. If Selene only drains the victim's life force partially, she achieves a measure of psychic control over her victim's mind, thereby subverting them to her will. Through unknown means Selene can also cause a human being to become a psychic vampire like herself, but be subordinate to Selene's own will. Selene's youthful appearance and vitality depends upon her absorbing the life forces of one or more people on a regular basis. This restores Selene to a youthful and healthy appearance when she has been injured, or when she over-exerts her other powers, and sustains her centuries-long life. A side effect of this process is that Selene remembers the life of anyone she absorbs. By using the absorbed life energies that sustain her, Selene can enhance her physical strength, speed, stamina, agility, reflexes, and durability to superhuman levels. The amount of energy she has retained from her victims does seem to correlate somewhat with her physical strength and resistance to injury. Selene can momentarily move at superhuman speeds of around 175 miles/hour, though this requires a heavy expenditure of energy and can cause her to age rapidly and require more life energy immediately. It is not known how often Selene must drain a human's life force in order to survive. Great expenditure of power causes Selene to age rapidly, but she can rejuvenate herself by absorbing more life force. Selene appears to be immune to most forms of conventional injury; she has survived both a knife wound and a crossbow bolt to her heart with no apparent lasting effects. While not indestructible, she once survived and recovered completely from molecular discorporation, though it took considerable time to reconstitute herself. Selene's most direct weapon is the telekinetic power to animate and/or levitate inorganic matter on a molecular level, by projecting part of her absorbed life force into it. She can affect nearly anything within her line of sight, and can warp and alter the molecules of inanimate matter to her whim, causing objects to wrap around and constrict others, creating lifelike humanoid structures to combat her opponents, or simply reducing objects to dust. She can use this power in more standard ways, such as creating powerful force fields around herself, and can levitate herself and others but cannot truly fly. Selene can also control and manipulate fire in a variety of ways, though she cannot create the fire herself; whether this is a facet of her telekinesis or a separate power is unclear. Selene possesses an undefined level of telepathic ability, though she is not as powerful as high-order telepaths such as Professor X or Jean Grey, and is vulnerable to psionic attack should she be directly engaged. She often uses her telepathy to blend her psychic signature into the background thoughts around her, making her difficult for other psionics to locate or track, or to induce a hypnotic trance in others, during which she slips away at superhuman speed, leaving them with the impression that she simply vanished. Selene is able to temporarily assume the appearance of others. Like many of her other abilities, it is unknown if this is achieved through magic, telepathy, or other means. Selene possesses considerable magical abilities and extensive knowledge of sorcery, enabling her to cast and counteract spells. While the full extent of Selene's magical skill is not known, her greatly extended lifespan has given her sufficient knowledge and experience to be considered a threat to Kulan Gath. She was able to cast an illusion sufficient to fool Kulan Gath at his most powerful. Selene was revealed as one of several magic-users with the potential to be the next Sorcerer Supreme after Doctor Strange by the Eye of Agamotto. Selene was briefly depicted as a being of semi-substantial living darkness with the ability to appear and disappear at will and, similar to Blackheart, imprison people in the dark energy she appears to be composed of. In more recent appearances, however, she has apparently regained her humanoid form and displays her original powers.